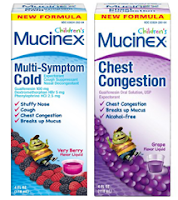 Right now you can possibly get a FREE Children's Mucinex from Smiley 360! All you have to do is login or register. Then look under the "Offers For You" section to see if you can qualify for the offer. If you are not a member, you should be come one! This company offers many different FREE product testings offer throughout the year.